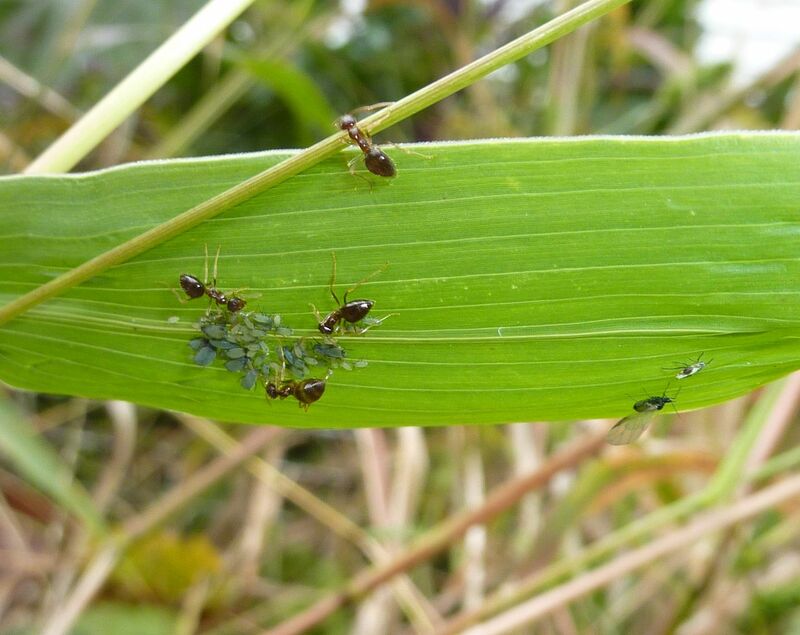 While cleaning up the yard some I discovered this patch of aphids under a blade of grass. 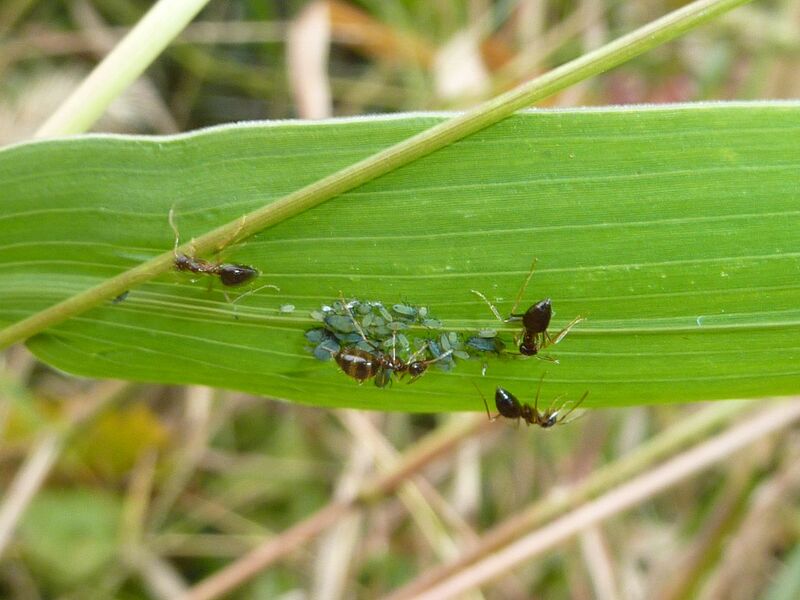 There was a steady line of Prenolepis imparis, Winter Ants, visiting them. 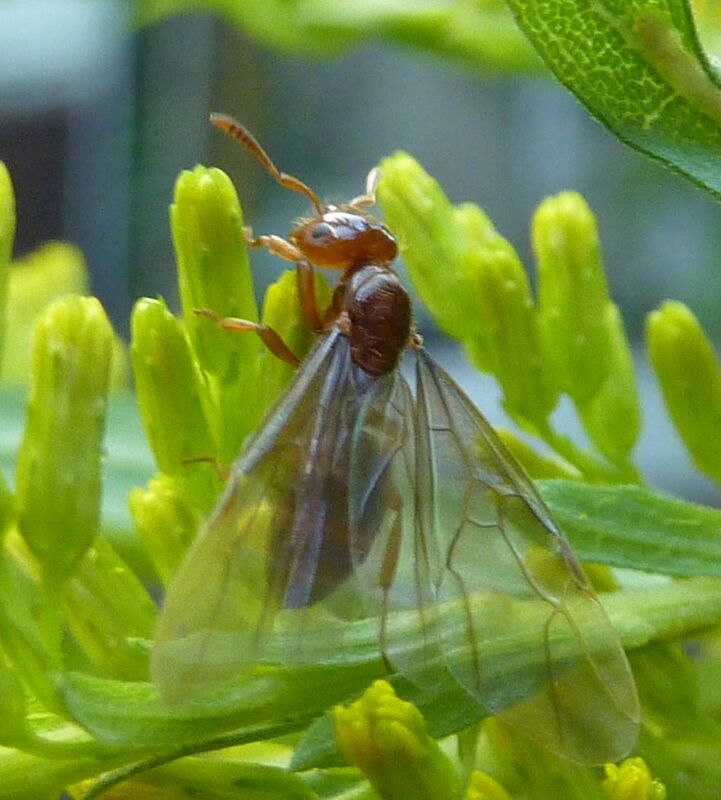 As temperatures drop down this will become one of the few species of ant out and about. 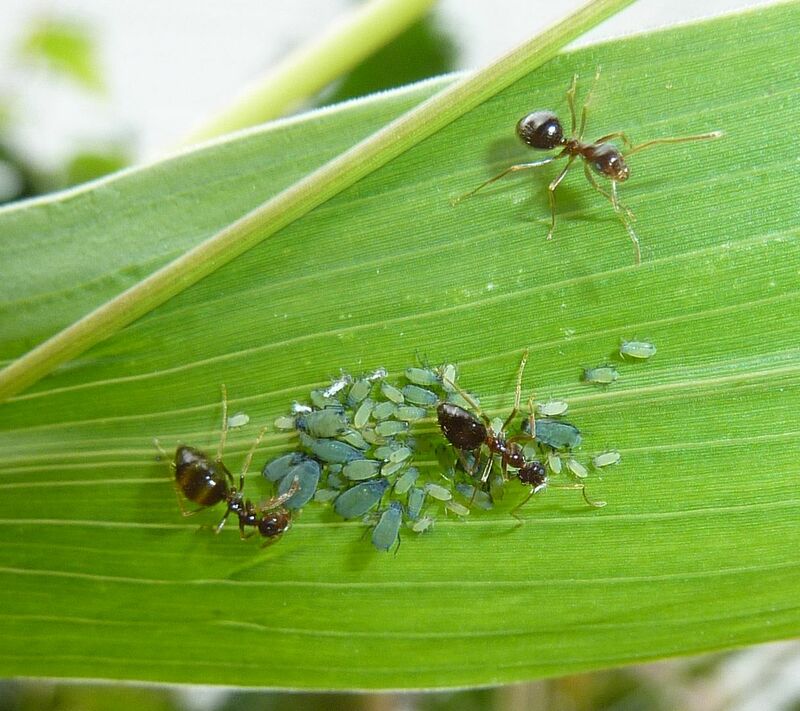 This is the first time I've seen aphids on grass. They have a neat blue-green color to them. If we, non-scientists, can fly an iPod into space, why can't we glue antennas to some bees? I'm gonna get right on that this spring. I hope to start this as a repeating segment called Gluing Stuff to Nature. I think this pictures is going to be my next painting. The honeybee is just a hair out of focus for the size it's currently being viewed, but it's otherwise a strong piece I think. The lighting is even, there's a clear focus in the middle, and there's a depth of field from the flowers in the background. This image doesn't have much of that. 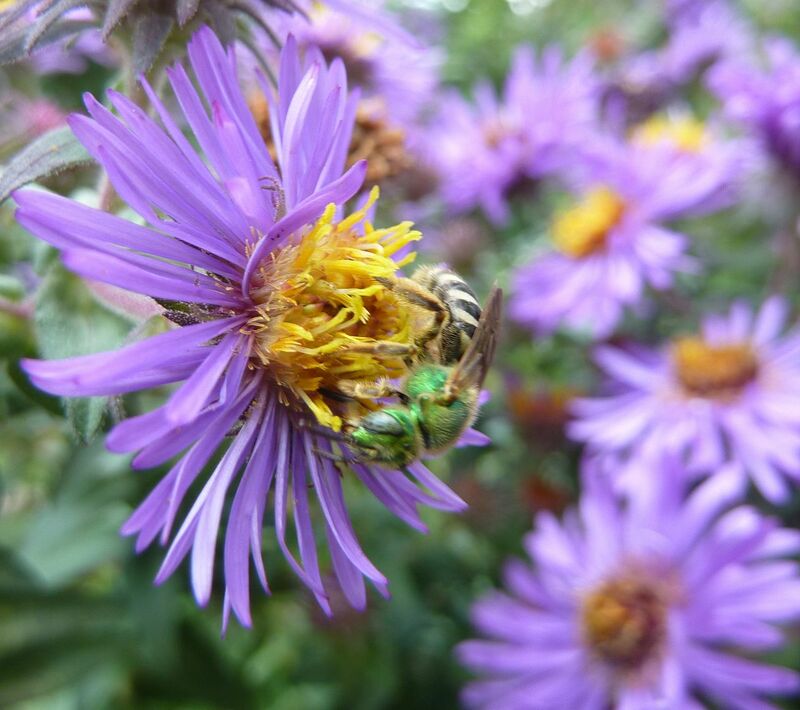 The harsh lighting almost turns the bee into a silhouette, there is a depth of field but it's introducing contrasting elements (Yellow and Purple are Complementary Colors), and there's a lack of middle ground which farther separates the image. 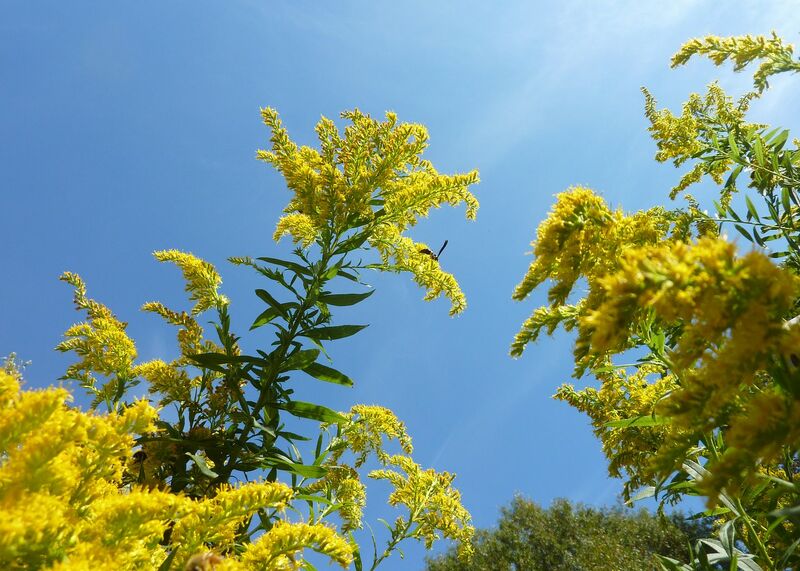 This is what I believe to be Solidago altissima, Tall Goldenrod. 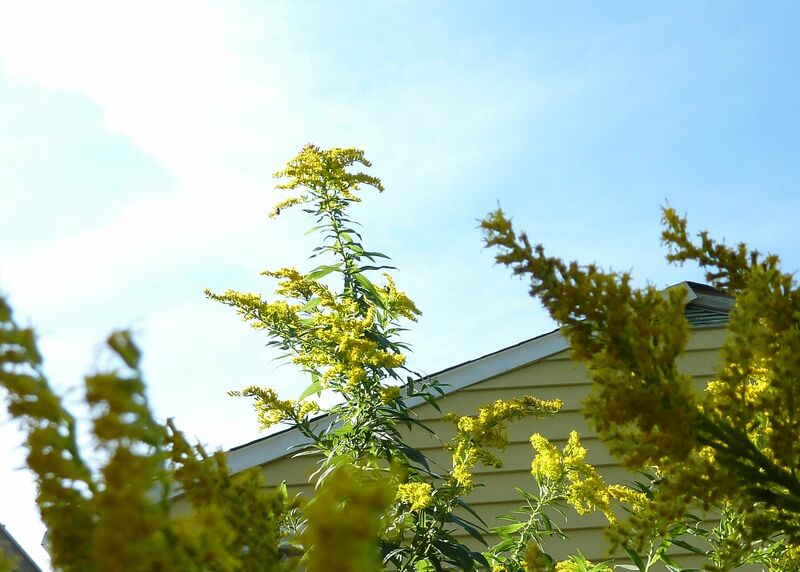 However, I actually wasn't able to find any source mentioning any goldenrod growing to be more than 8' tall and the tallest cane here was over 10'. I must have some good poorly drained, compacted clay soil or something. Here is what I believe is a queen bumblebee storing up food for next spring. There were a few buzzing about on the plant. 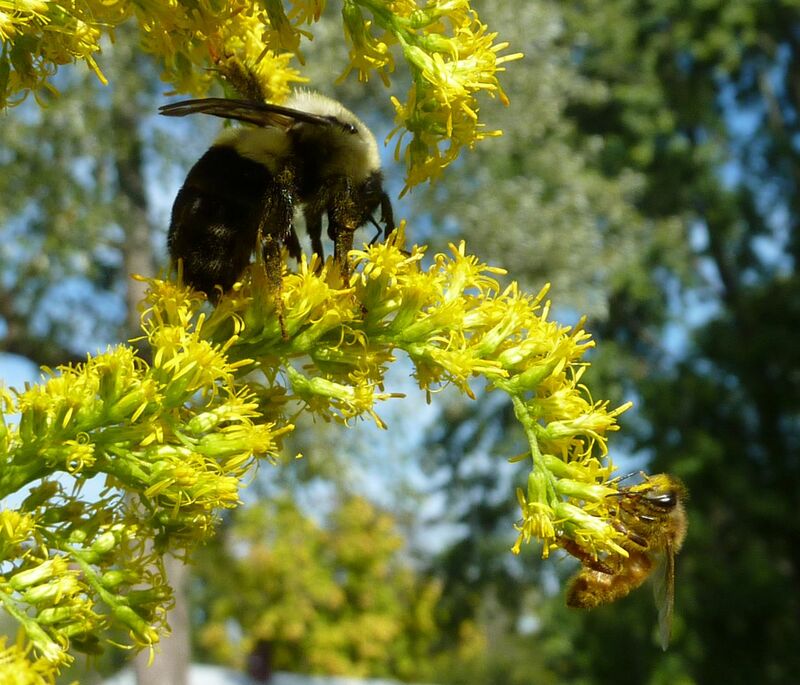 Bumblebees shouldn't be confused with the Giant Resin Bee, or Giant Carpenter Bees. 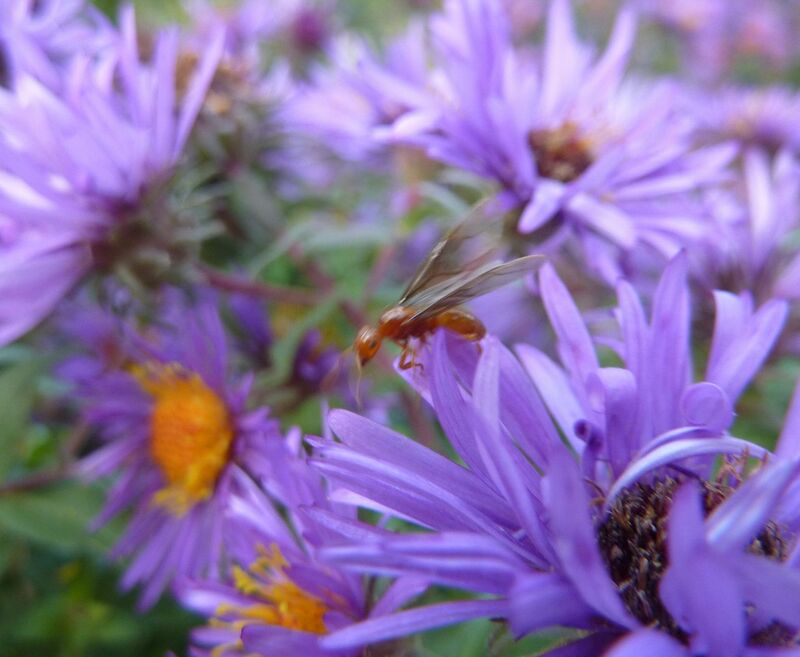 It's fall time and the last of the ant nuptial flights have been underway for a few weeks now. It's only appropriate that this happens with the last of the blooms too. Lasius claviger and Lasius umbratus queens emerge from nests during the afternoon hours. 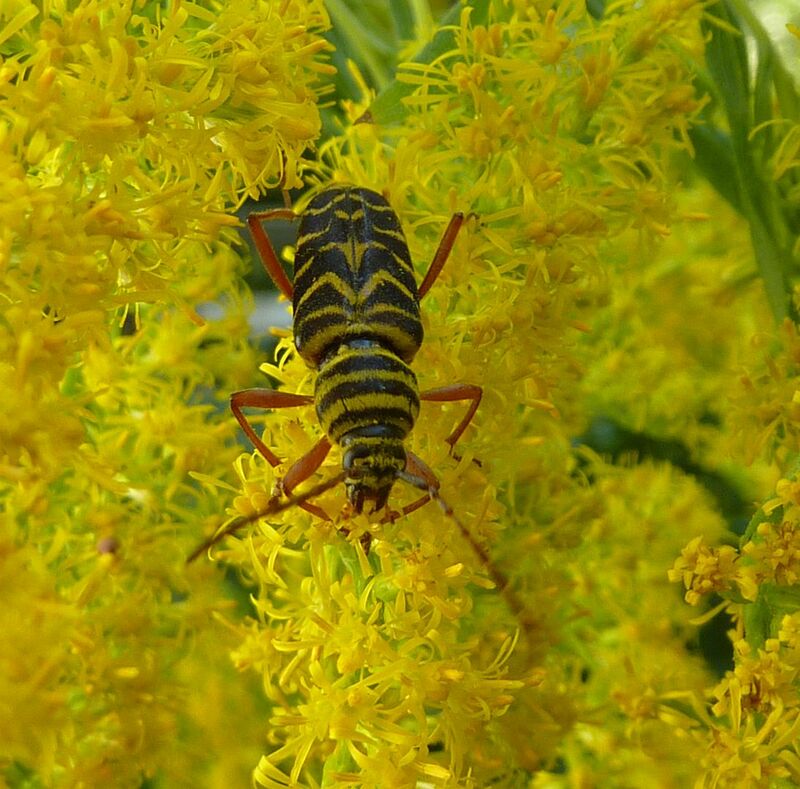 For some reason I find lots of them hanging out in goldenrod plants that are still in bloom, but only during the hours of the nuptial flight itself. Come darkness they disband and take to the ground looking for a host colonies. 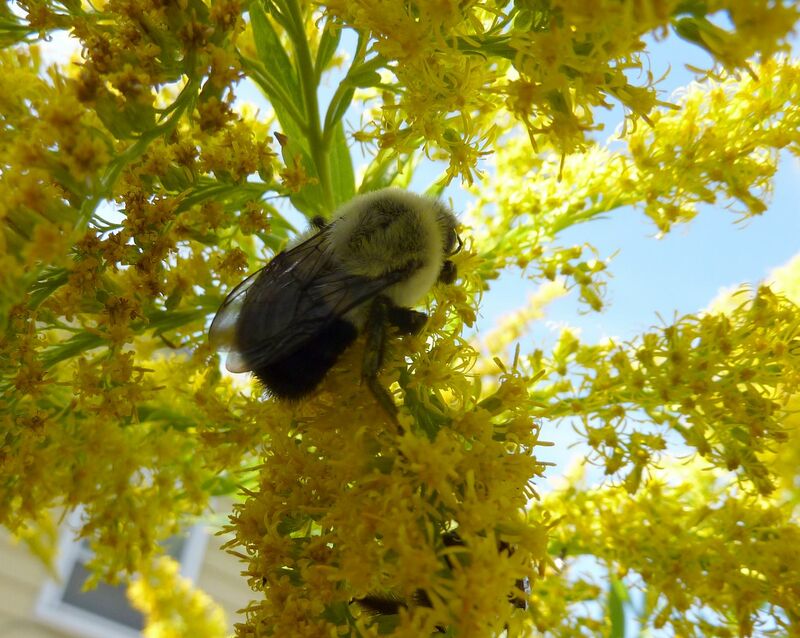 I'm not sure what it is about goldenrod that attracts them so. This isn't the result of a colony under the plant and the queens simply trying to climb up high to take off. 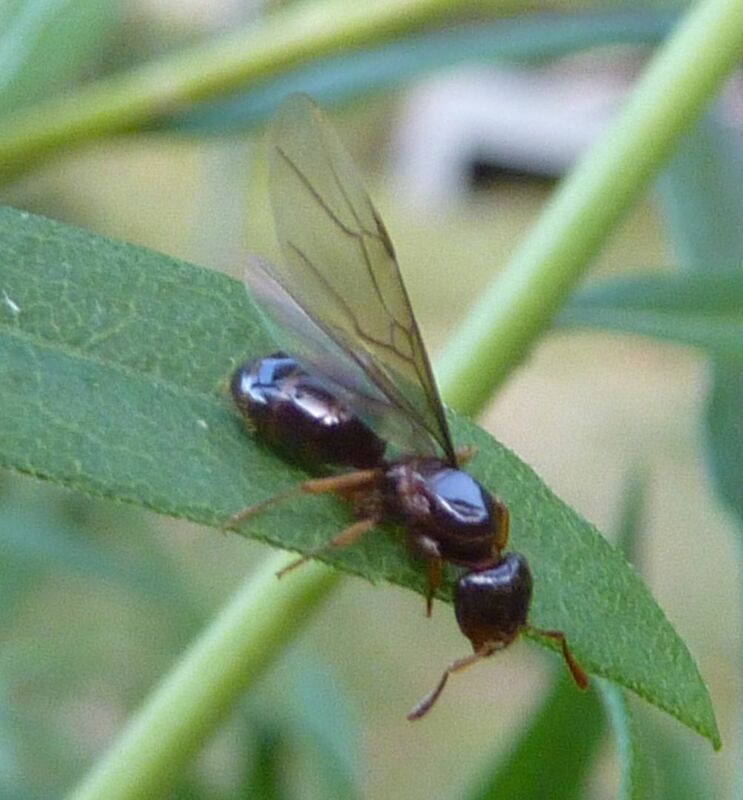 Many of the queens are stationary on the plant and have shed their wings. The only thing I can come up with is they're attracted to the light scent the flowers give off. 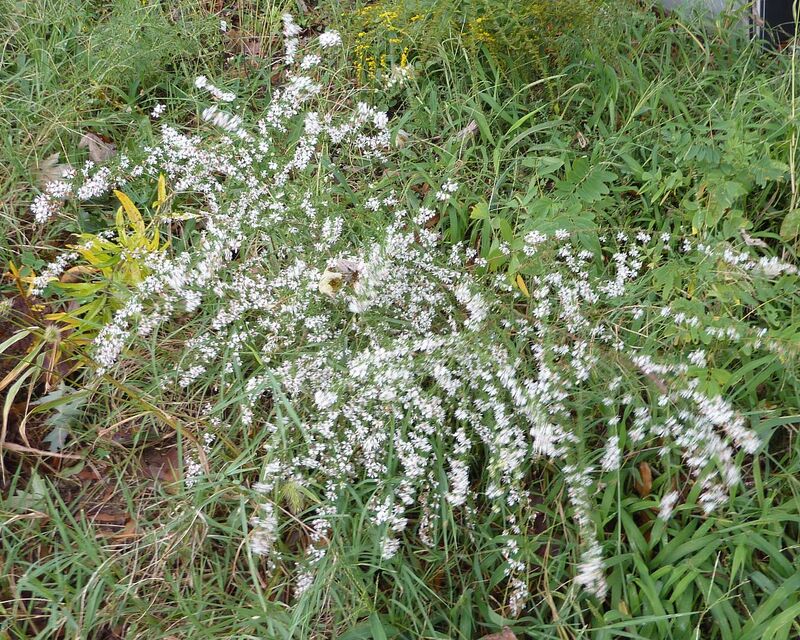 In case you're wondering this plant is Solidago gigantea. 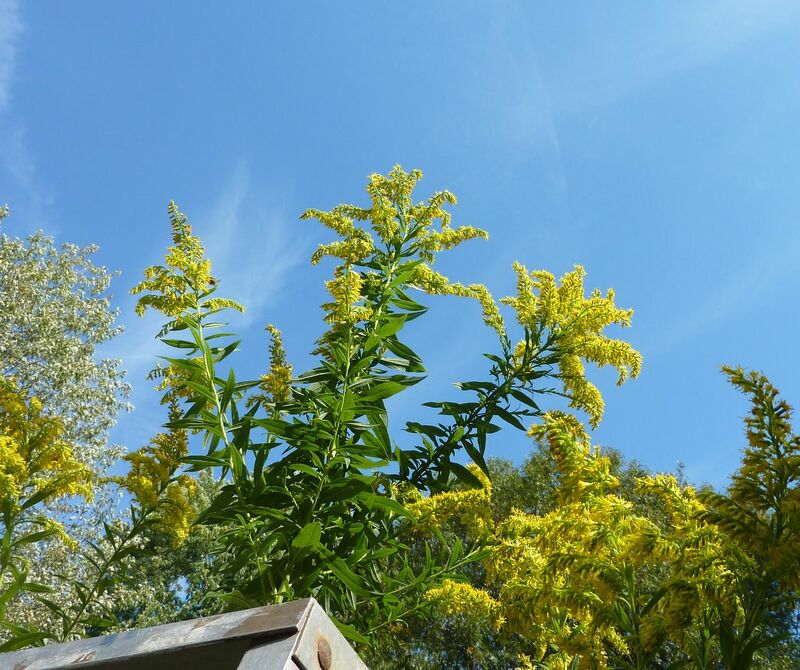 It's one of the tallest goldenrods in North America. Online sources say it gets up to 8' but I've seen it surpass 10' on some years. 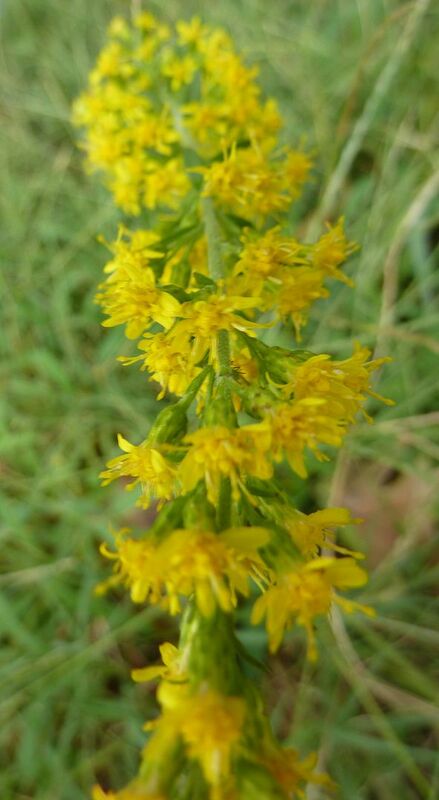 So this got me thinking, maybe they're not attracted to just Goldenrods but perhaps other plants in the composite family. 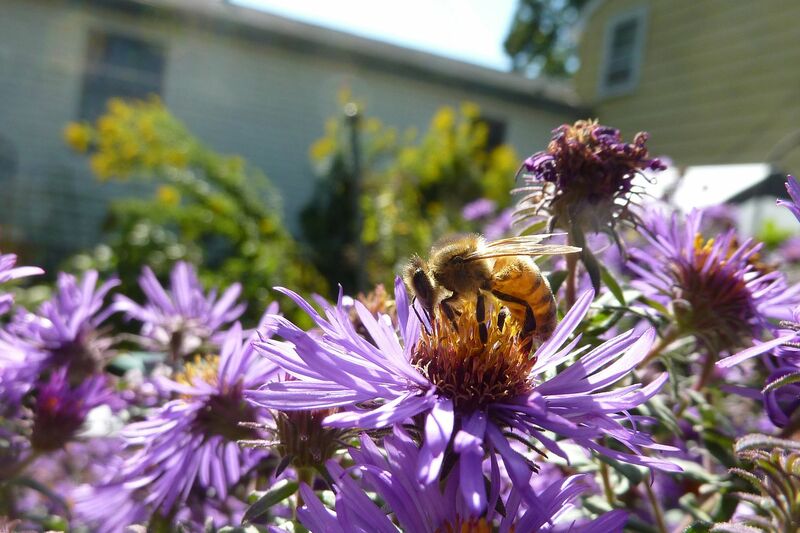 Sure enough upon inspecting my New England Aster I found a queen or two on the plant. However, I was only able to find two total. And these were trying to take off. 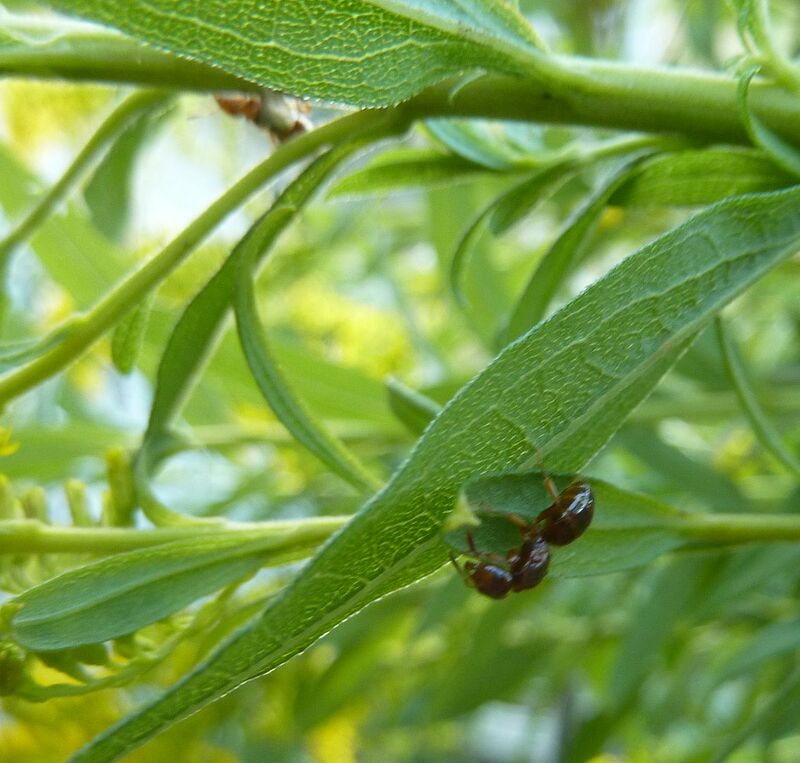 They were not being relatively stationary on the plant. 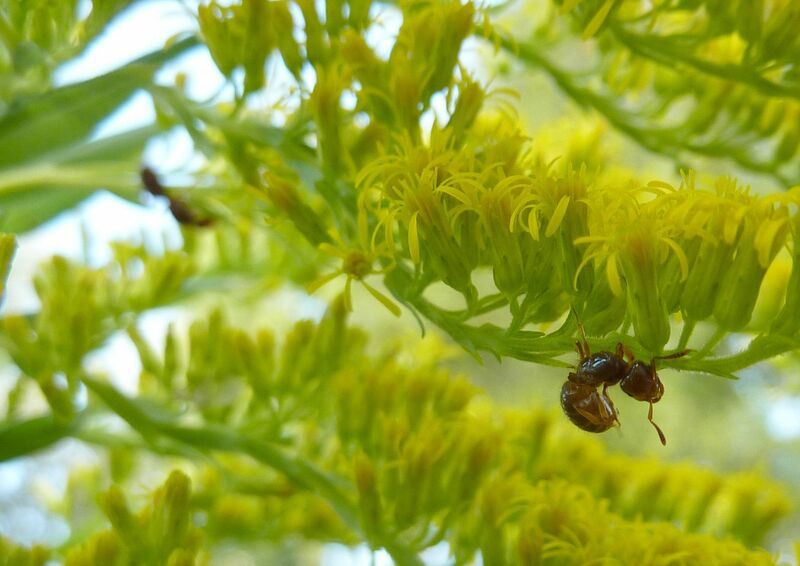 So it's looking like they're only attracted to Goldenrods that are in bloom. I checked other plants as well and couldn't find them on anything else. Why don't studies like This make the news? "Overall, elevated expression of pesticide response genes was not observed." This little sentance is all I would have needed to read. You see, I've been a firm believer that CCD was simply a pesticide issue for years now and no one was caring because it was likely happening on crops that don't use honey bee pollination, however the bees were still using the crop for food or water anyhow. When you have a pesticide like neonicotinoides out on the market that stay active for 9 months inside the plant, that sounds strong enough to wipe out a few hives to me. So what that one sentance means is, insecticides are a separate problem and CCD has some other elusive cause. Those genes should have been active if pesticides were present. Seriously, you'd think a company like Bayer would be propagandizing the hell out of that study! Do they like being the bad guys? Going back to the study linking viruses and fungi to CCD I still have trouble understanding the findings in that lower chart. And my concerns still stand. Without knowing more it really does seem like something got to their samples and the virus fungi invasion is a result. Maybe they weren't feeding their samples and thats why so many of their control bees died? How great would it be if online studies included videos detailing their work? I need to start YouTube for scientific studies or something. I would like to thank Alex Wild for setting the me straight. His blog at Myrmecos.net is where I found the study explaining the pesticide thing. And another thing! Why did 40% of their control die after 14 days. Each group was comprised of young worker bees 3 days old or younger (they can't fly at that age and are easy to handle). 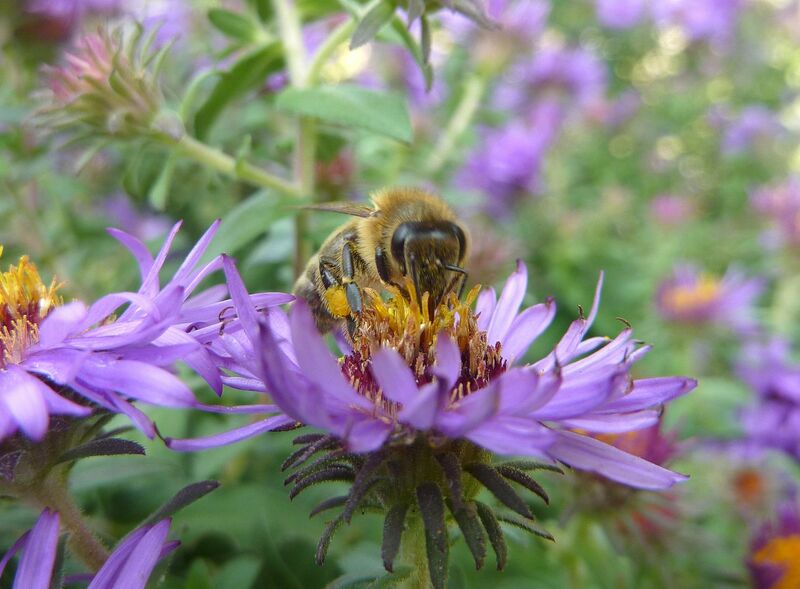 Honey bee workers normally live 30 to 60 days. Why did 40% of their control die after 14 days! 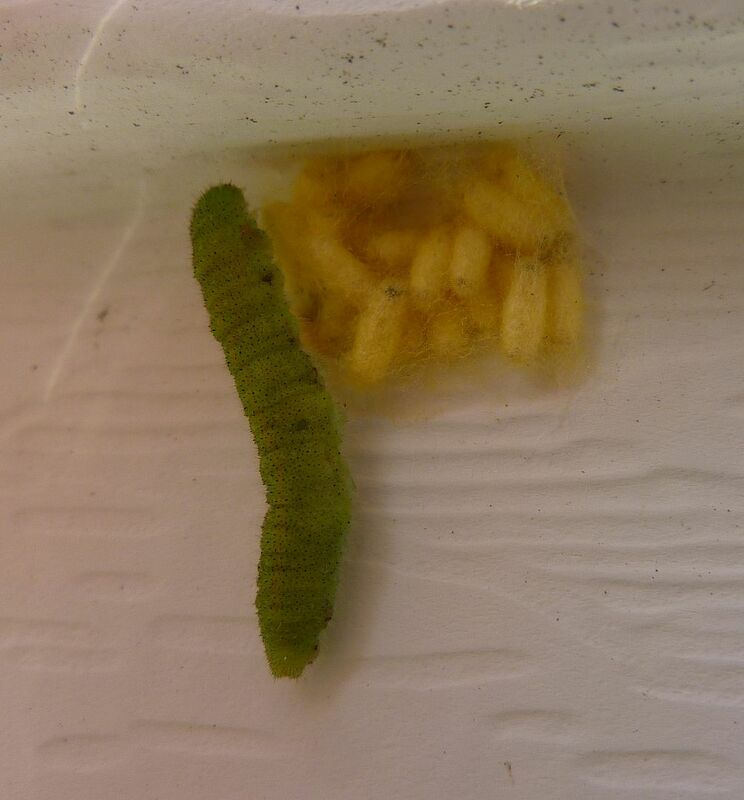 Why is the difference between having one infestation over both at the same time only 10% after a 14 day period. 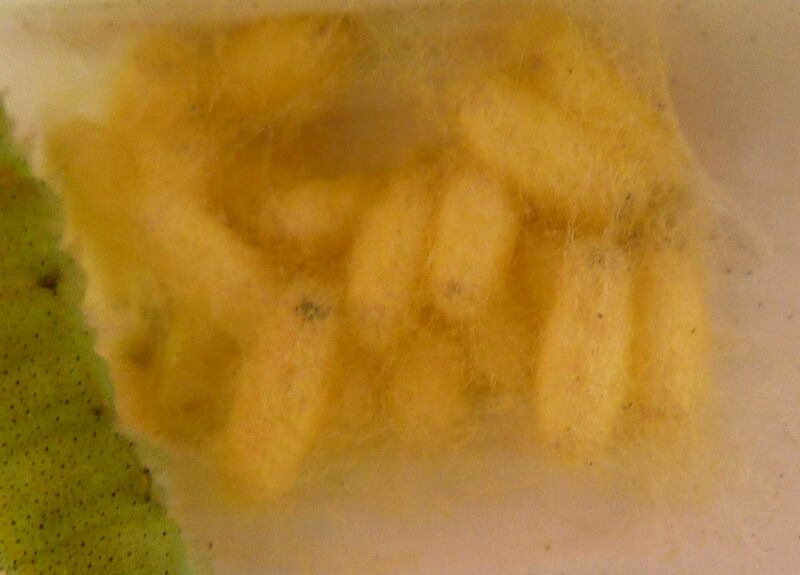 The article claims a hive can survive if they only have one of either the fungi or the virus. Their control should have had a survival rate above or around 90%, the virus and fungi separately should have been higher as well. It's hard to bounce back when more than half of the hive dies off after 14 days, worker bees aren't even foraging until day 12. What we're seeing here is clearly all of the groups have been contaminated with what ever causes CCD and the presence of the virus and or fungi just make it worse. A friend sent this article to me earlier today. And what's really cool is I found this happening along the side of my house! 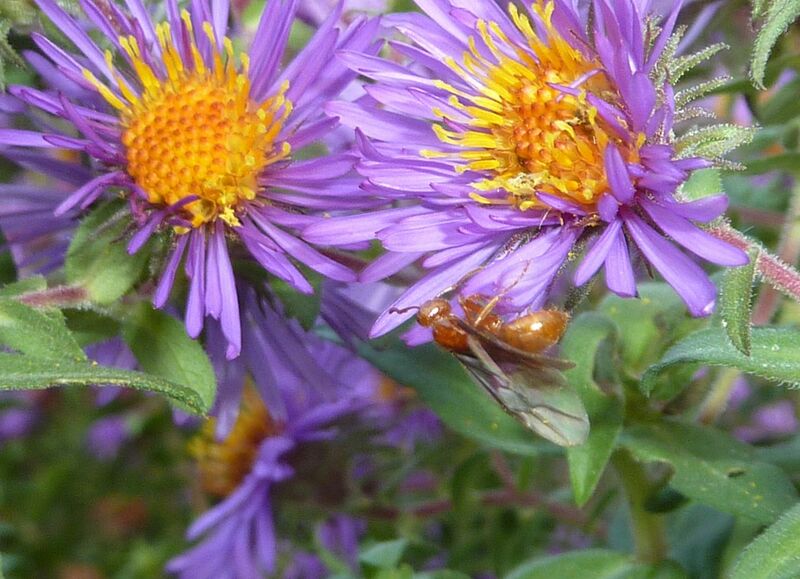 Well the New England Aster, Symphyotrichum novae-angliae, has started blooming up a storm. 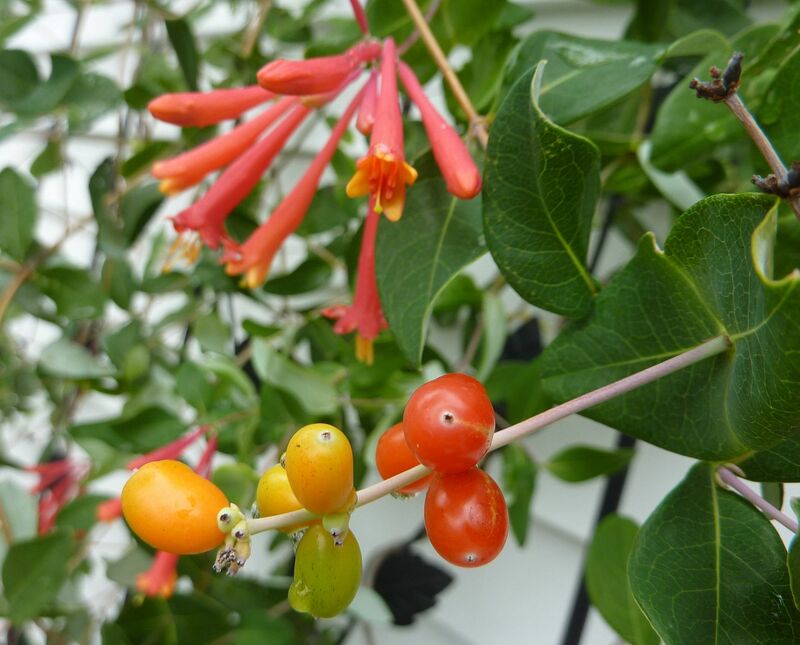 This plant comes in other colors as well including red, pink, purple and pale or intense versions of those. What's great though is you always get the intense yellow anthers inside the flower that play off the color so nicely, even against spent flower heads that are brown and going to seed. The only down side as you can see in the video is the plants can get to tall and fall over. This is usually avoided at the nursery because the plants will have been cut back to a few inches in June or July. 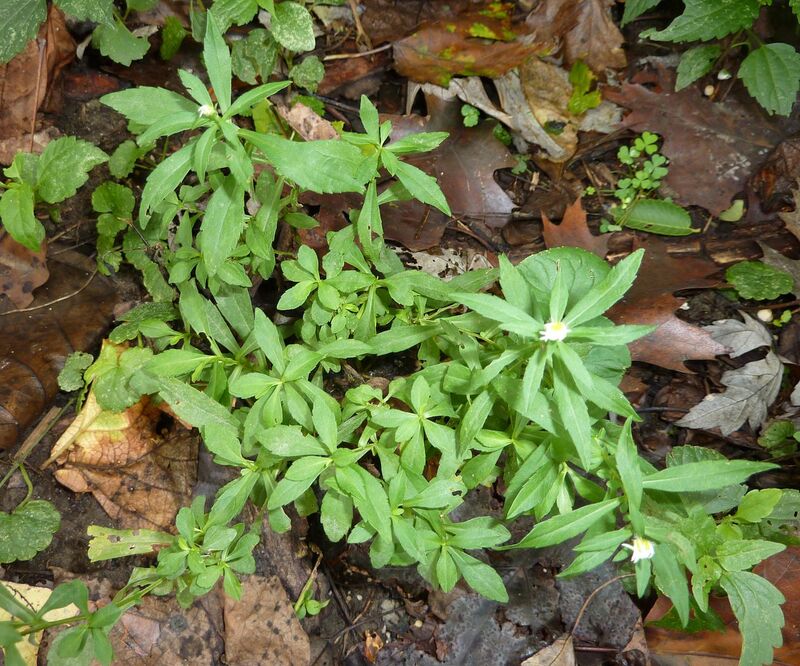 This promotes the compact flowering part to form closer to the ground. Jerry Bromenshenk is my new hero for the moment. A New York Times article today talked about the findings that a new study has found a link between a virus and fungi combination that is causing CCD. 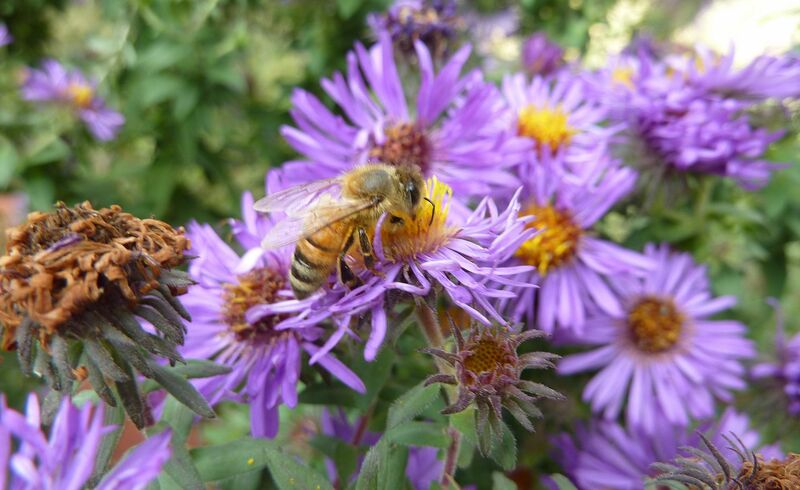 The article also mentions his using of honey bees to help detect land mines. Which shockingly enough has evidence to back it up. Read here! Detecting explosives with honey bees aside, here is the abstract to the scientific study linking viruses and fungi to CCD that the article is based on. So basically the viruses got on their cell phones and called the fungi, and were all like, "Yo, I'm inside a Bee! Why don't you come join me?" And the scientists (the stupid ones anyhow) were all like ... Cell Phones cause CCD! Granted I had my own little theory, or at least I sided with the people saying it was neonicotinoid sprayed crops that sweat out the chemical in their sap. That has proven incorrect but at least it was more plausible a theory than putting a cell phone in a bee hive and calling them up. 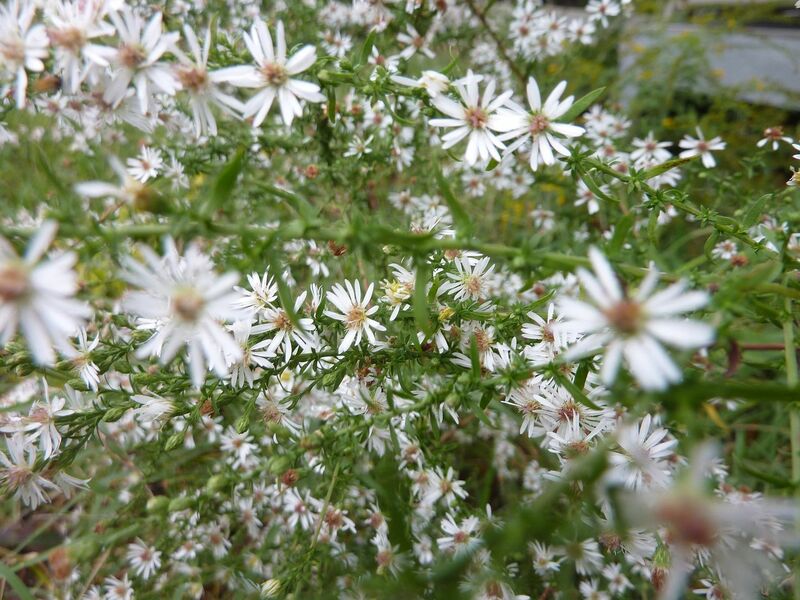 A White Wood Aster of some type is one. 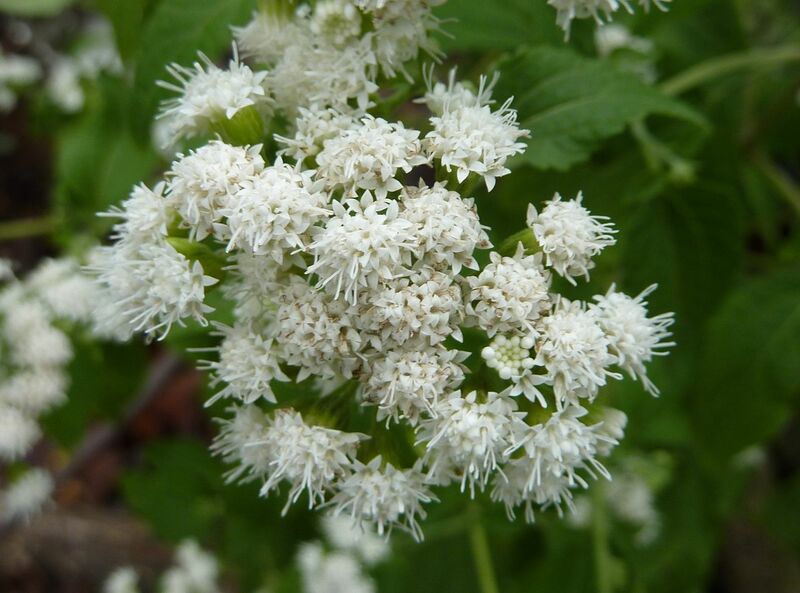 The other is White Snakeroot. 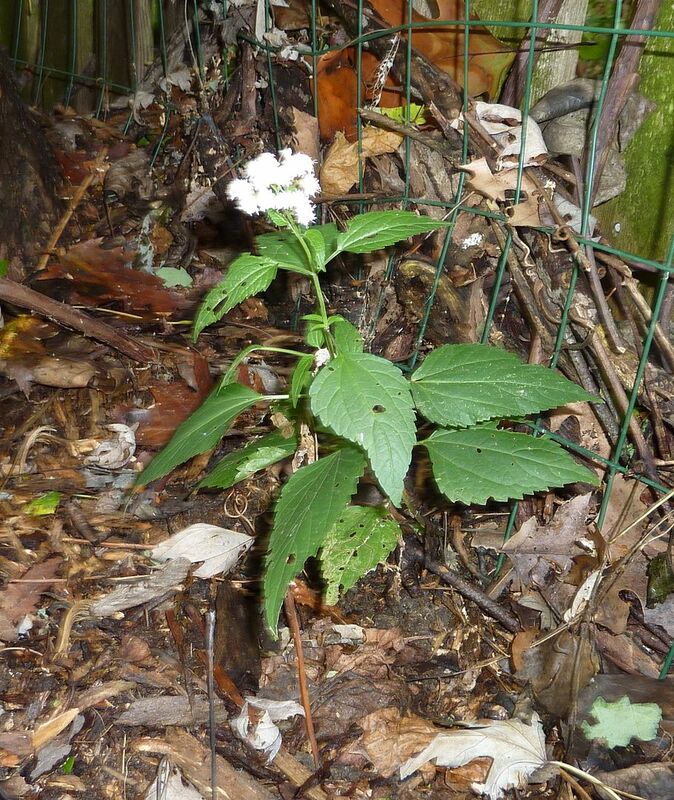 This plant is notorious for causing livestock to produce poisonous milk at least to humans. Not a plant that farmers or people with to much land should be growing, at least if there is livestock around. 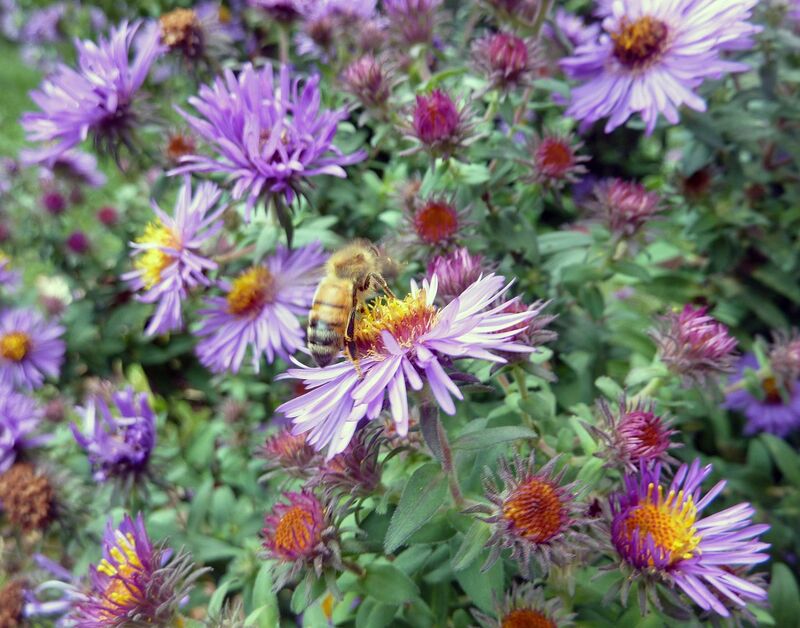 Both plants are typically swarming with pollinators, usually smaller flies and sweat bees though. 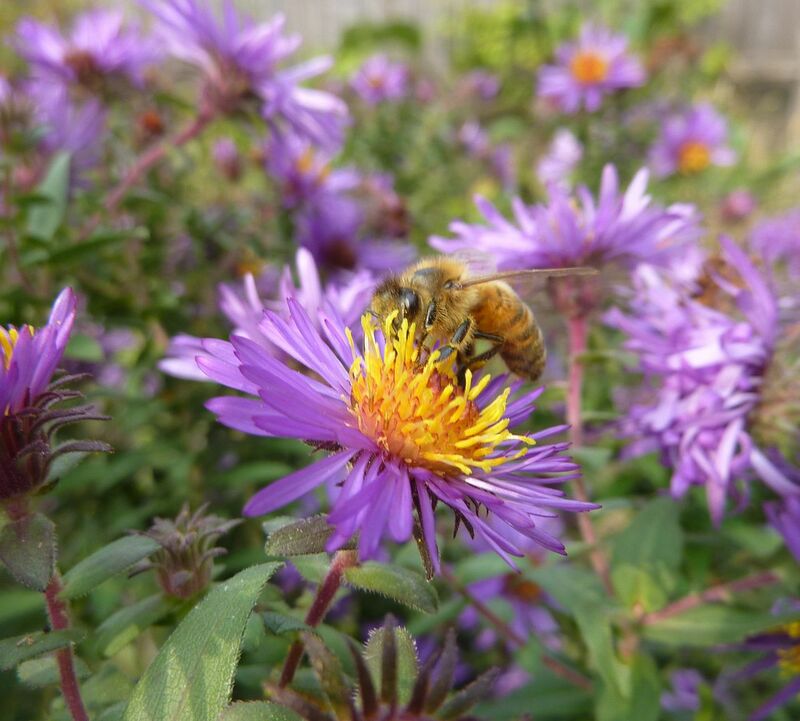 Rarely I'll see a honey bee on them and surprisingly enough I have never seen a bumblebee working either plant. I took these pictures on a cloudy day where it had rained all morning. So there wasn't much out. 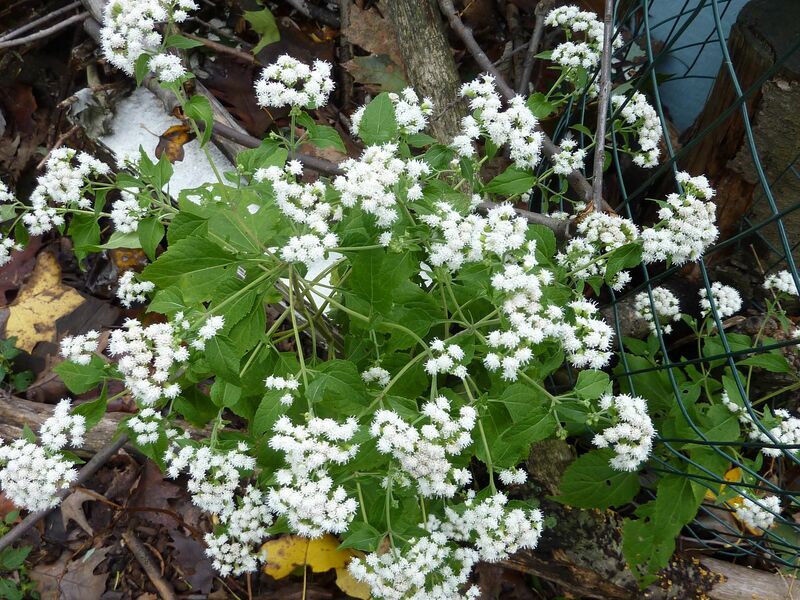 Normally I'm not a fan of white flowering plants, and these two in particular aren't the prettiest I've seen. But there's something about them planted in mass, and if the light hits them just right that makes the whole area look prettier than it does on other times of the years. 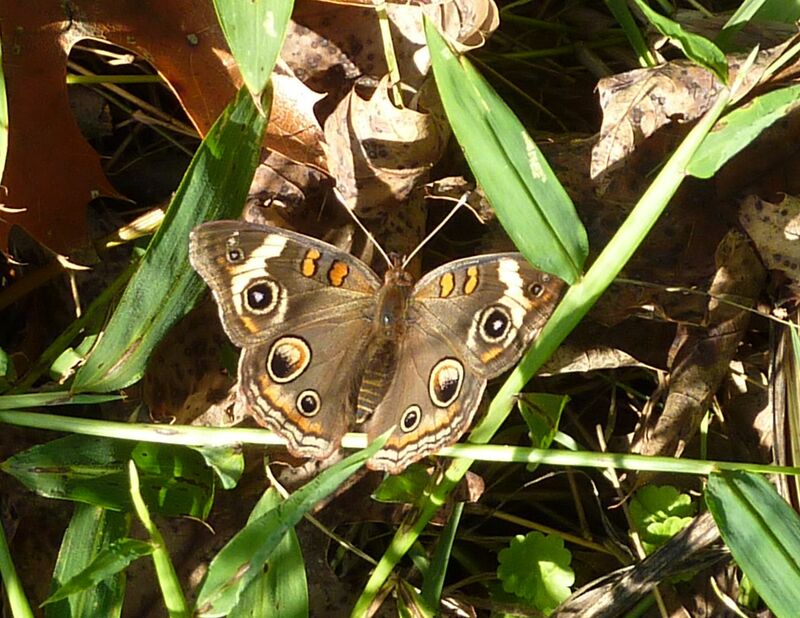 The yard is littered with young plants with both species. 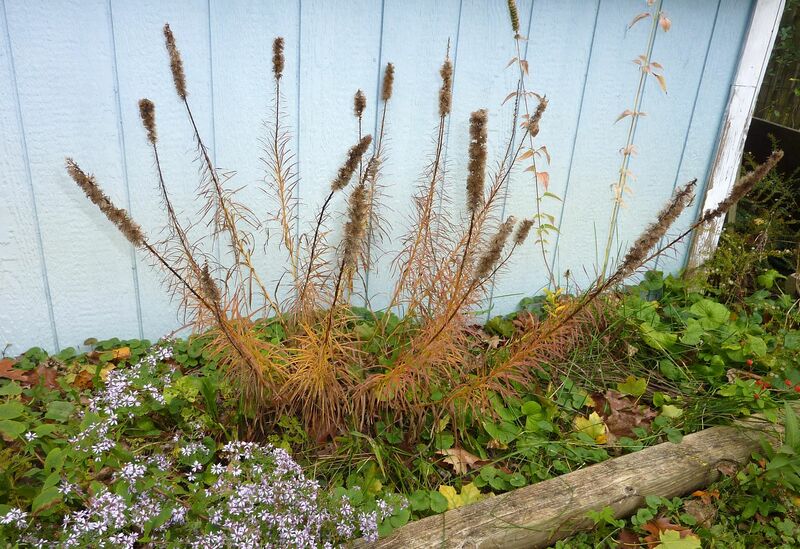 If our yard became uncared for these two would surely take over among other plants. Another plant slowly springing up all over is one of the shorter Goldenrods. 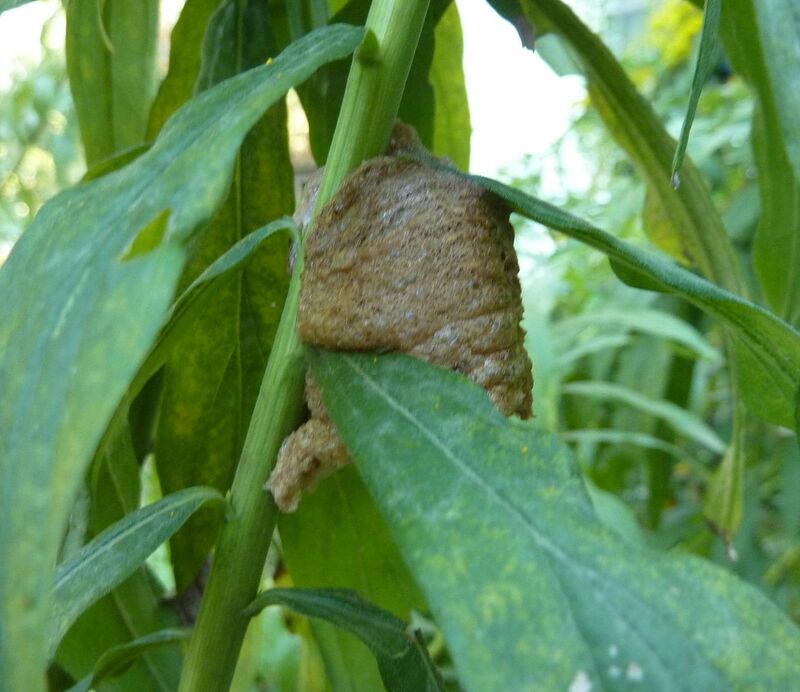 Barely reaching 2' tall, I see this plant coming up in the dryer parts. 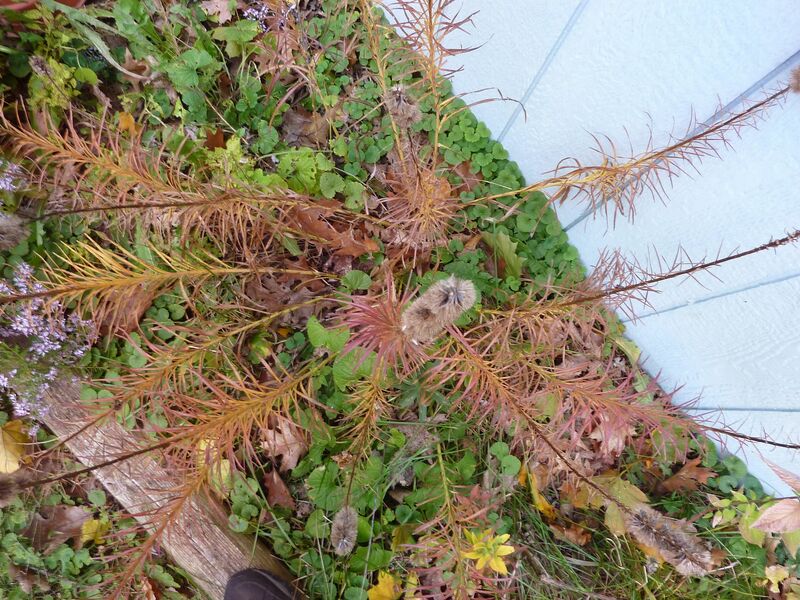 This is the 5th species of Goldenrod to start growing out in the yard. I suppose this is a benefit to not weeding out the garden. 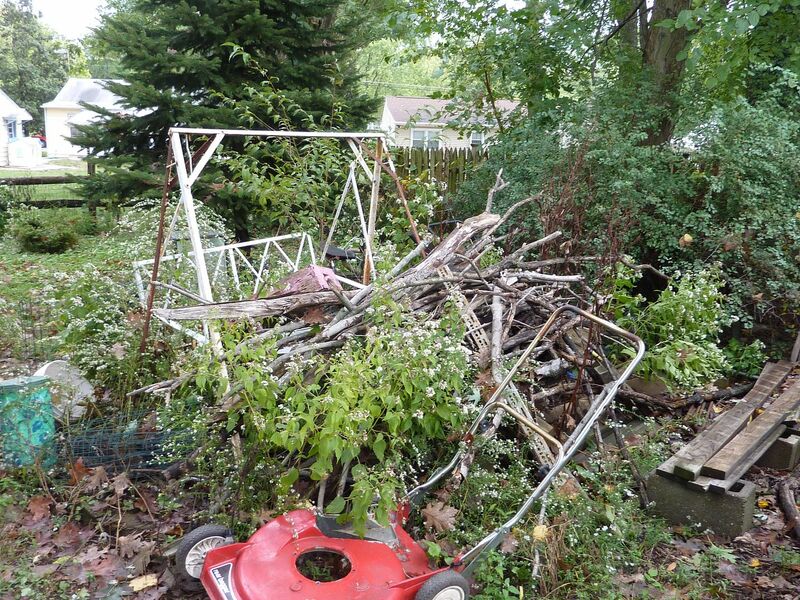 But I guess the lesson here would be to learn what young plants look like before weeding it out. 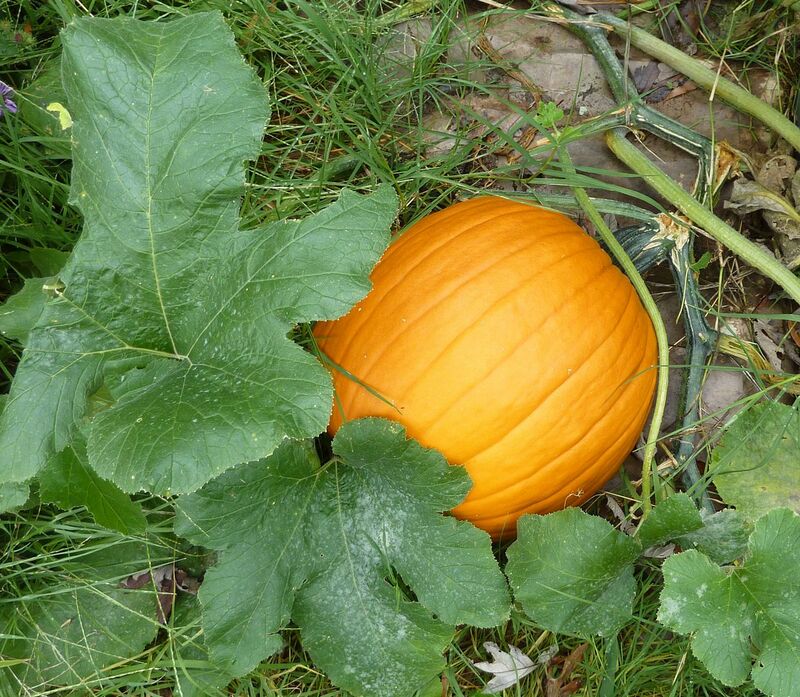 The last volunteer I'll talk about is this pumpkin. The vine probably measures 25' and wasn't planted by me. Last year's compost pile was turned into a garden and this plant started growing of it's own steam. I allowed it to grow because I was curious to see what it would become. Watermelon, Cantaloupe/Muskmelon, Zucchini, and so on all look like the exact same vine to me, and some of them are simply the result of selectively breeding certain traits in and out of the plant.